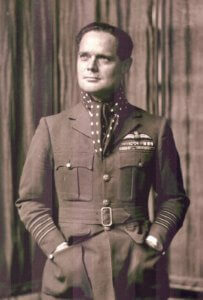 Born in London, Douglas Bader was the son of a Great War veteran who died in France in 1922, of wounds received. His mother re-married and Douglas was brought up in Yorkshire and first attended the Temple Grove Preparatory School, Eastbourne as a boarder. 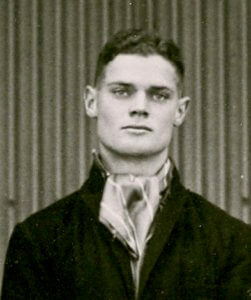 He moved to St. Edward’s School in the Michaelmas Term of 1923 and stayed until the Summer Term of 1928. A member of Cowell’s House, his time at the School rather mirrored his life afterwards. He was a competitive, rebellious and aggressive pupil by all accounts, often in serious trouble due to his complete disregard for the austere regimes at both his schools. So much so, his first Warden, William Ferguson, was on the verge of expelling him several times. Bader’s salvation came with the arrival of Warden Henry Kendall in 1925, who immediately saw the potential Bader possessed, tolerated his rebellious and often arrogant nature, mainly by encouraging his love and aptitude for sport. By his final years at St. Edward’s, he had represented the School at Cricket, Rugby Football, Boxing, Squash and Athletics and was also appointed a School Prefect, something that would have been considered highly improbable earlier in his career. Such was his reformation that he managed to pass into RAF Cranwell in 1928, under the influence of Kendall and with the financial help of Walter Dingwall, a Housemaster at the School, who became a lifelong friend and supporter. He later played Cricket, Rugby Football, Squash, Hockey and Boxing at different times for Cranwell College, the Harlequins, Surrey, RAF, and the Combined Services. His adventurous spirit continued to get him into trouble and he was warned about his frequent breaches of rules at Cranwell and threatened with expulsion yet again. As always, he survived and in 1930 was commissioned as a Pilot Officer in the RAF based in Surrey and immediately became involved in air shows, often flying very low and performing unauthorised aerobatics – some of which were extremely dangerous. He flirted with the possibility of Court Martial several times, but always managed to charm his way out of trouble. Finally, on 14th December 1931 his luck ran out and while performing low level aerobatics, his wing tip touched the ground and he crashed. He was rushed to the Royal Berkshire Hospital where both his legs were amputated, one above and one below the knee. His convalescence was long and painful and was not helped by Bader’s impatience to get up and moving without delay. 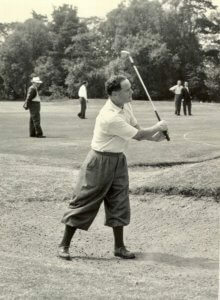 He was fitted with artificial legs and, in time, managed to walk with an awkward gait, drive a modified car and even play golf. In 1932, he was married to Thelma Edwards. Despite his handicaps, he tried hard to re-enter the R.A.F., refusing all desk jobs and insisting on a flying role. Eventually after many rejections, the outbreak of war enabled him to re-enlist and eventually take over leadership of three squadrons during the Dunkirk evacuation and the Battle of Britain. Eventually, after over 60 sorties his luck ran out and he had to bail out of his damaged aircraft, minus one of his prosthetic legs, and was taken into captivity in Germany. He escaped several times and was eventually incarcerated in Colditz Castle, where he remained until the end of the war. Post war, Bader became a national figure with Paul Brickhill’s book ‘Reach for the Sky’ and a film of the same name starring Kenneth More in the leading role. He entered the world of Shell Oil, retiring in 1969 as Managing Director of Shell Aircraft. He was in much demand as an after-dinner speaker and was frequently in the news with his robust and no-nonsense views on life in general. Always a strong supporter of the School he was a Governor 1970-82 and in 1979 lead the appeal for funds for ‘Douglas Bader’ Sports Complex which opened two years later. He died in 1982 of a heart attack. His awards and decorations include Knight Bachelor in 1976, CBE, DSO & Bar, DFC & Bar and mentioned in Despatches.